We’re going to be in the 20’s next week. You heard that right, 20’s. While thats probably not too cold for most of you (coughcoughJEREMYcoughcough) it’s plenty cold for us Texas Folk. Before the temperatures drop I decided to sneak in a Dunbarton Tobacco & Trust Muestra de Saka Nacatamale paired with a bottle of Founder’s CBS, or Canadian Breakfast Stout. 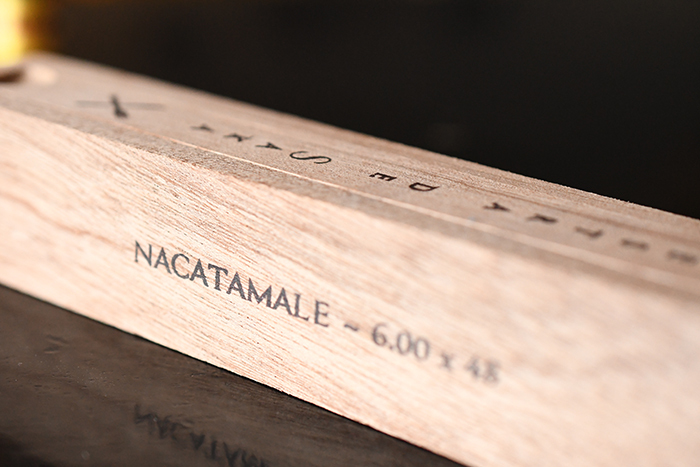 The Nacatamale is the second vitola released in the Muestra de Saka line. There is said to be up to 7 more, but that hasn’t been confirmed as of yet. Muestra de Saka translates to “Sample of Saka” which is created to represent what the Master Cigar Maker Steve Saka’s unique flavors and exactly what he looks for in a cigar. Sound familiar? I guess in a way the Muestra de Saka is Dunbarton Tobacco & Trust’s version of the Liga Privada which Saka created during his tenure at Drew Estate as a cigar that was crafted for his own personal enjoyment and later released to the public. 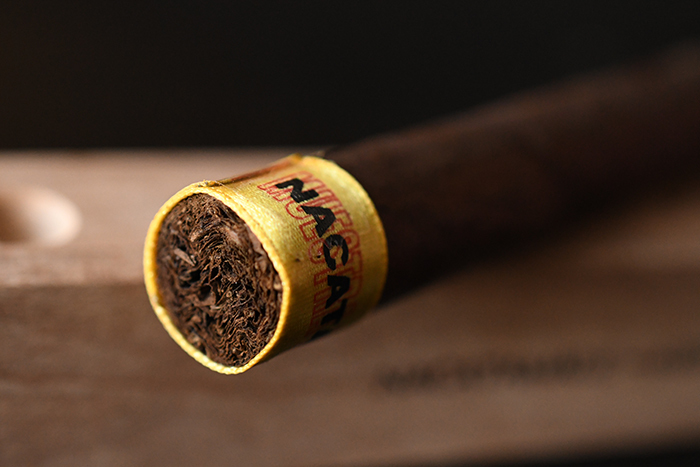 The Nacatamale is a 6 x 48 cigar wrapped in an Ecuadorian Habano wrapper over a Nicaraguan binder, and filler tobaccos coming from a single farm in Jalapa. Using this method is incredibly difficult as it focuses on the careful leaf processing, selection, and positioning within the bunch to tweak, and ultimately create the flavor profile Saka was looking for. For you beer buffs this is similar to a Brewery following the Bavarian Purity Law of 1516 only instead of limited to resources, the brewery would be limited to items found in their particular farms. The Muestra de Saka Nacatamale is a limited run which comes in a unique box count of 7 per, running $15.95 a stick. I purchased a box of these over from our good friends at Smoke Inn before Steve Saka himself sent a few our way to sample. 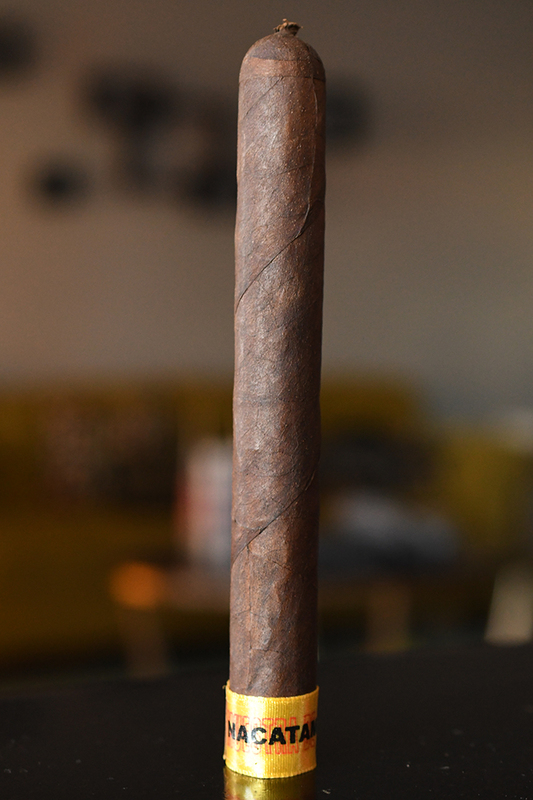 The Dunbarton Muestra de Saka Nacatamale carries a very consistent, very dark brown wrapper with some slight darker splotches located around the cap. 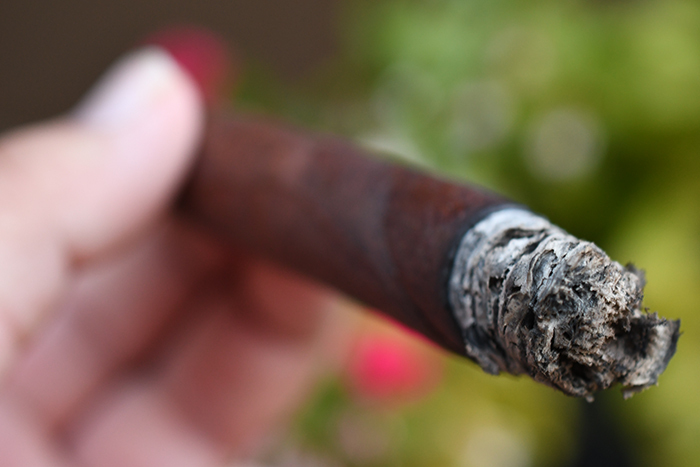 The cigar’s texture is very toothy and grainy with some slight oils seeping through. 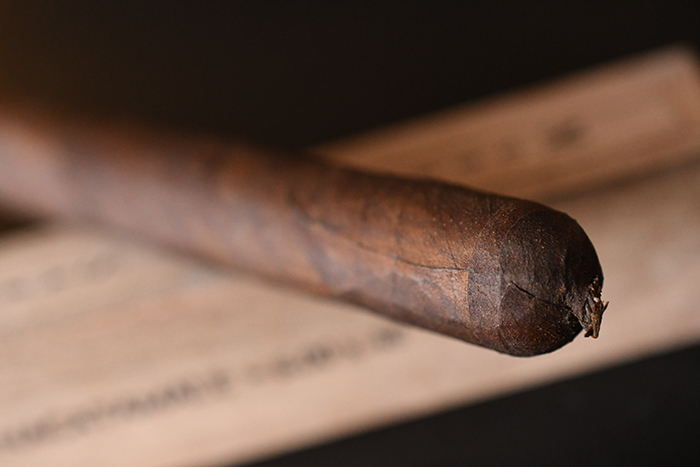 There are a few smaller veins running through the cigar’s body and as a whole the cigar is very, very firm and feels to be very tightly packed. 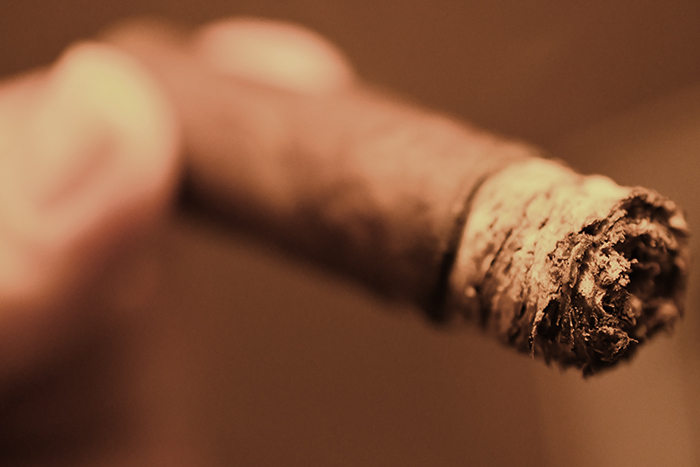 The cigar’s slender body leads up to a beautiful, stubby pigtail cap. 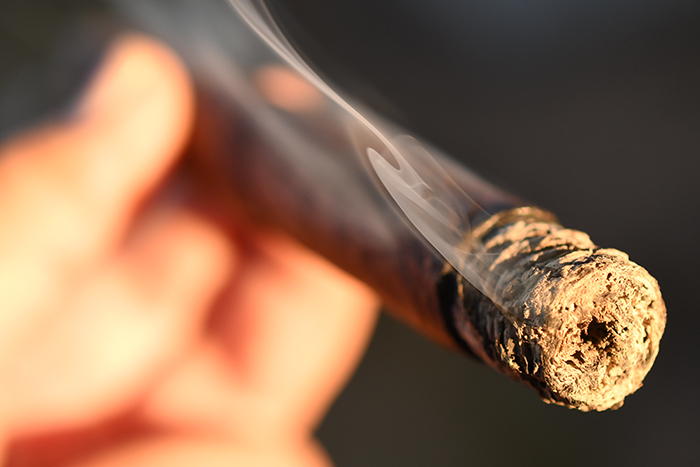 The cigar comes packaged in beautiful wooden coffins and carry only a yellow ribbon around the foot of the cigar containing the words “Muestra de Saka” in red and “Nacatamale” over it in black ink. The wrapper on The Dunbarton Muestra de Saka Nacatamale gives off some great oaty/earthy aromas with some slight vanilla while the foot of the cigar is much more sweetness driven with lots of chocolate and spice. The cap cut clean and easily using my Xikar XO double bladed cutter. The cold draw produces some very sweet dark chocolate, cedar, and slight earthy flavors. The Dunbarton Muestra de Saka Nacatamale starts out with a nice little cayenne pepper zing that tickled my mouth and tongue through the first few puffs of the cigar. After the pepper faded I was greeted with lots of dark chocolate, black cherry, musk, and sweet almost Christmas-themed spice. Hoping that I don’t just have Christmas on my mind it seemed as though there was a bit of pine and espresso buried down in there as well. Despite being so firm and tightly packed the Nacatamale is burning like a dream. Each tiny puff kicks out just enough thick, white smoke which really sticks around white the cigar releases a small amount of stationary smoke as it rests in my ashtray. The burn line is dead even and razor thin leaving behind a tightly compacted trail of medium to dark gray ash which held on for an inch before falling into my lap as I was too busy enjoying the cigar rather than paying attention to the ash. Into the second third of The Dunbarton Muestra de Saka Nacatamale and it’s still going strong. Lots of dark chocolate, musk, sweetness, cedar, and black cherry. There are still some slight hints of the pine ever now and again, but that’s almost gone. There are some notes of maple creeping in though. I know most may chalk that up to my pairing choice but I have it written down in my notes of smoking the cigar prior to sitting down and reviewing it as well. The retrohale really brings the pepper back in the mix, but at a tolerable level so I find myself retrohaling from time to time. The cigar is still burning perfectly. I close out the second third with a very mild nicotine kick. Into the final third of Muestra de Saka Nacatamale and I just can’t get enough of this cigar. The body has been in the full arena the entire time while the strength has hovered right around medium/full. The cigar is still leading with dark chocolate, musk, spice, and black cherry with some great sweetness, and vanilla with some soft maple. The pine has been removed for a while now. It took me 2 hours to take this cigar down to the nub and I almost burned my fingers off smoking it. 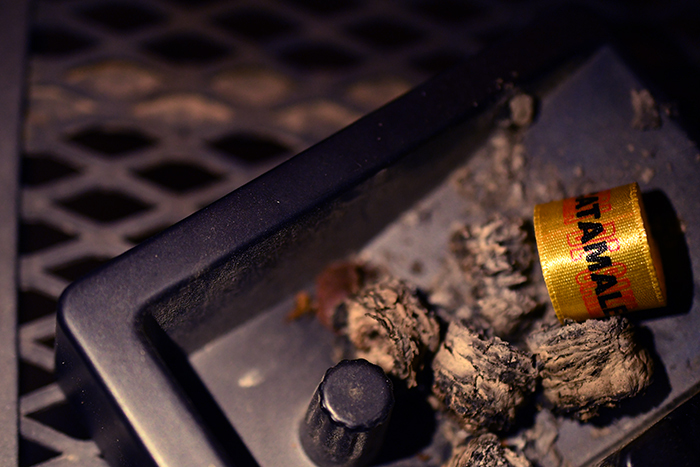 There was no harshness, nor extended heat and the cigar burned flawlessly from start to finish without any help from my torch. I close out with only a minimal bit of nicotine. Hands down in my humble opinion the Muestra de Saka Nacatamale is my favorite cigar released from Dunbarton Tobacco & Trust to date. Its meaty, its complex, its bold, and the flavor profile is something that I personally love. The price is a bit steep but in this case you get what you pay for and thats a cigar that delivers. These are limited, and the box count is small enough that even with the higher price this is something I will try to have stocked in my humidor for as long as I can. Ah yes, Founders is at it again. We should all be familiar with their KBS by now. CBS is a similar beer as its an 11.7 % ABV imperial stout brewed with chocolate and vanilla aged in maple syrup – bourbon barrels. I was expecting it to be closer to KBS than it actually was. Much more drinkable and smooth. While you get the bite from the bourbon and acidity from the coffee on KBS the CBS is much, much sweeter. The maple really comes through especially as the beer warms. I didn’t get much bourbon until the beer was close to room temperature. Outside of the comparisons there are great notes of maple, dark chocolate, roasted malt, and coffee over some really light cinnamon, black cherry, and vanilla. In my opinion I liked this one much more than KBS. That being said it’s easy to see why I chose this pairing. Vanilla, chocolate, black cherry, maple and spice are all notes I picked up in the Muestra de Saka which made for an absolutely beast of a pairing. 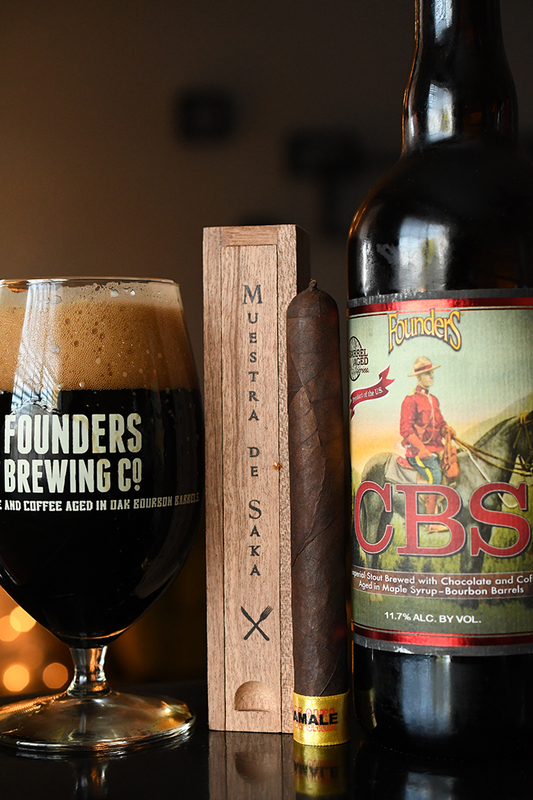 I think this beer could easily overpower most cigars but the Mustra de Saka held its own and in some cases actually dominated the beer.